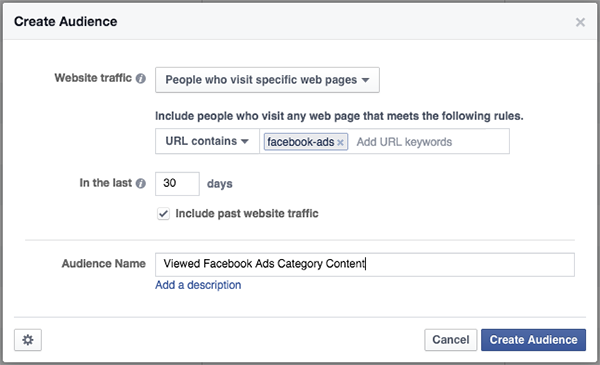 It’s been more than 10 months now since Facebook started rolling out Website Custom Audiences. I saw it as a gamechanger at the time, and this powerful tool has not disappointed. If you aren’t familiar with Website Custom Audiences, it’s time to get familiar. You’re falling behind. 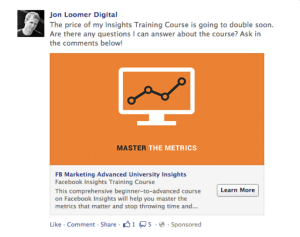 In a nutshell, it’s the ability to create Facebook ads that reach specific visitors to your website. 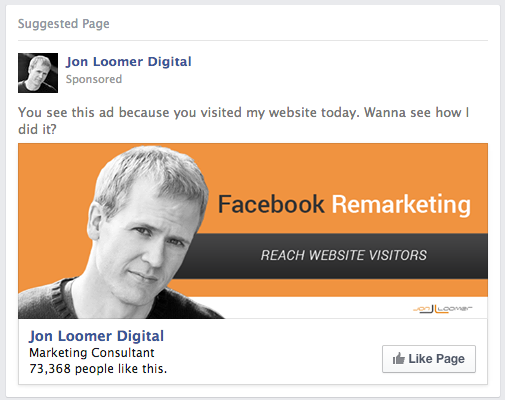 I can’t remember the last time I created a Facebook advertising campaign that didn’t include targeting of my website visitors. It’s probably been 10 months. The Website Custom Audience is extremely versatile. I use it to build my fan base, drive website traffic, grow my email list and sell. You can use it for just about anything. But because it’s so versatile, the possibilities are pretty much endless — which makes the thought of remarketing for newbies a bit overwhelming. That’s why I created this post. I want to cover as many remarketing strategies as possible. In this case, I’m going to focus these strategies on Website Custom Audiences. I’m going to focus this post on Website Custom Audiences, but it’s important to at least mention the alternative: FBX. On the surface, FBX and Website Custom Audiences are very similar. In each case, a pixel is placed within the template of your website that allows you to build audiences of people who have visited any page or specific pages so that you can remarket to them with ads. FBX (Facebook Exchange) is the original way of remarketing on Facebook. With FBX, you use an approved third party vendor like AdRoll or Perfect Audience (click one of those affiliate links to get a credit) to create domain ads that appear on Facebook that target specific visitors to your website. Website Custom Audiences, of course, are created on Facebook within Power Editor or the Ads Manager. As a result, you can create any ad you normally would, but target visitors to your website. No third party tool when you use WCAs. Keep all of your ads together. Create any ad you want. Lots of advantages with WCAs. 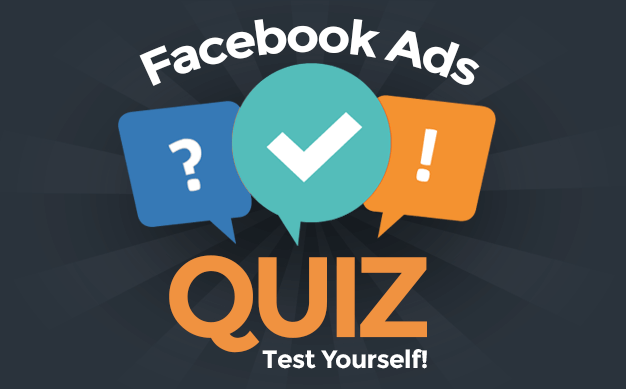 With FBX, you can only create one type of ad — a domain ad — and it isn’t connected to a Facebook page, app or event. Since it’s done through a third party, that third party also needs to take a cut as well. In my opinion, the vast majority of advertisers should be using Website Custom Audiences. For the typical business, the advantages far outweigh the weaknesses. But big retail websites should consider using both. If your brand is selling hundreds or thousands of products, FBX allows you to create “liquid” ads — automatically showing ads based on the product page you visited. With WCAs, you’d need to create a different WCA and different ad manually for each product. 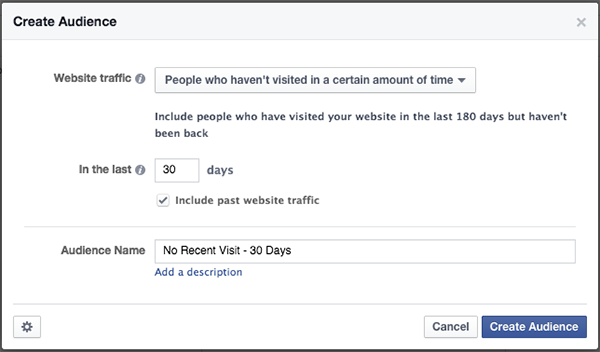 The WCA that gets the most use on my ad account is “All Website Visitors – 30 Days.” This allows me to target anyone who has visited my website during the past 30 days and returned to Facebook. 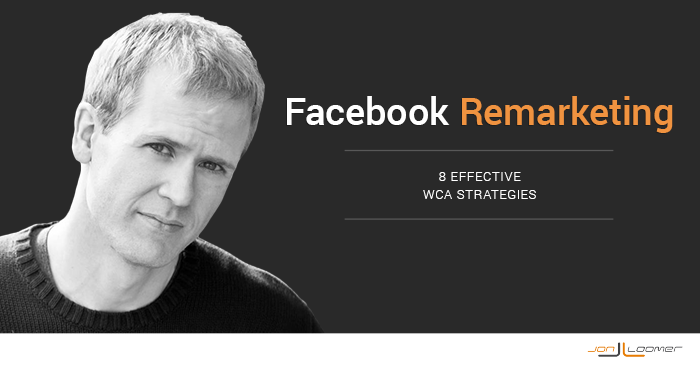 It’s the default type of WCA that Facebook has you create, and for good reason. It’s incredibly useful. I target all website visitors to build my fan base. These are people who have visited my website recently, so they know who I am and also know the value I provide. These people are most likely to like my page. I target all website visitors to drive website traffic. If you’ve visited my website recently, it was likely to read a blog post. And if you read a blog post before, you’re more likely than the typical Facebook user to want to read a blog post by me again. I target all website visitors to build my email list. If you’re a recent visitor to my website, you are more likely than most to enjoy my content and trust me as a writer. So when I offer a free webinar or ebook, a recent website visitor has built-in expectations regarding style and quality of that content. This is a stupid-proof group of people to target. It works really, really well. In fact, I now prefer this user to the typical fan who may not have otherwise visited my website recently. When you create a WCA, the default duration is 30 days. So you can reach anyone who visited specific pages of your website during the past 30 days. That’s great. Very valuable. But you have other options, too. You can build a WCA with durations from one to 180 days. If your website gets fewer than 10,000 visitors per month, for example, you should experiment with longer durations. Just know that the relevance drops the longer that duration goes. On the flip side, take advantage of short durations if you get more traffic or are willing to use a very low budget. This is going to reach the smallest group of people, but while your content is fresh in their minds. Of course, this could seem very creepy in some industries, but it’s hugely effective for me. You’re also more likely to get a conversion when reaching people who visited your website or a specific page more recently. Again, you may need to limit your budget, but it can be worthwhile. 1) Drive relevant website traffic. Let’s say that your website has content that covers many different topics. As an example, let’s say it’s a social media marketing website like Social Media Examiner. SME publishes a ton of content, but not about a single type of social media marketing. They cover Twitter, Pinterest, Facebook, YouTube, Instagram and more. As a result, they can create WCAs for each of those topics. The category would need to appear somewhere within the URL so that when a user visits that web page Facebook will add them to the audience. This way, SME can more accurately target a relevant group when trying to drive website traffic. They could promote a post about Twitter by targeting all website visitors, but they’re bound to reach people who have no interest in Twitter. Instead, they can target anyone who has read a post about Twitter on their website during the past 30 days (or the duration of their choice). Based on the section of the website you visit, I learn a lot about you. If you’ve previously clicked the Women’s Clothing category, I know that you have interest in women’s clothing. This helps me if I have a product that is related to women’s clothing — I can focus only on these people. Similarly, some people are bargain hunters and browse the clearance section. This is a great group of people to target with special deals. You could also sell products by targeting people who have read related content. So I could sell my Power Editor course to anyone who has read a previous blog post about Power Editor. I recommend that you create WCAs for every main category of your website. This could be by content category or main navigation items that visitors may click when visiting. You should create a WCA for every landing page on your site — at least those that get active traffic. Every time I create a new landing page, I immediately create a WCA for it. You can then target people who have visited that specific page before. When it comes to selling products — particularly high priced products — customers often need time to make their decision to buy. So you can create ads that take a unique approach to messaging to encourage the purchase. I’ve also used this as a way to answer questions that someone may have who is thinking about buying. If you have a manageable number of products (both free and paid), you should go through the process of creating WCAs for the success page of every single one of them. This page would be what a customer sees immediately after buying or opting in (“thank you for your purchase…”). This allows you to generate a dynamic list of specific customers. While there may be reasons for using a short duration, I always make sure to create one with the longest possible duration — 180 days. I can then combine this audience with an email list Custom Audience of customers to make sure I cover all who have bought or opted in. This is necessary for a couple of reasons. First, an email list Custom Audience is not dynamic. You have to upload new lists constantly for it to be up-to-date. Also, the email address used to buy is not always the same as the email address used on Facebook. The WCA will actually capture most customers, but the limitation is that it is a rolling 180 day window. Once outside of 180 days, that customer will no longer be captured. One way to use the success page WCA is for up-selling or upgrading. You have a list of people who have bought Widget 1.0. Widget 2.0 has been released and you want to let them know about it. Or you have a higher priced version that you want to up-sell to that group. Of course, you could also cross-sell. You’ll see on Amazon, for example, that customers who bought one product are likely to buy a related one. So you could use similar intelligence to cross-promote other products. Excluding a WCA is helpful for a couple of reasons, so we need a special section for this. Earlier, we talked about abandoned shopping cart advertising where you target those who have visited a landing page but haven’t yet converted. You would do this by targeting those who have visited the product landing page while excluding those who visited the success page. Additionally, you may be selling a one-time purchase product. For example, once someone subscribes to my ebook, there’s no reason to target them again with ads that encourage them to subscribe. So I would exclude both the email custom audience and WCA for that success page. Another way I like to use WCAs for exclusion purposes is when I promote my blog posts. Immediately upon hitting “publish” on a new blog post, I’ll create a WCA for it. So Facebook will build a list of all visitors who have read that post. While that allows me to do things like sell related products, it also allows me some important exclusion capabilities. I will share that blog post with my fans and then promote it with an ad. When I promote it, I’ll exclude those who have already read it to limit waste. Another way you can use WCAs is to re-engage those who haven’t visited your website lately. This way, you can target people who have visited during the past 180 days, but not during the most recent X number of days. Maybe you have members of a private community who haven’t engaged in a while. It would be good to bring them back in before they lose interest and cancel that membership. Or maybe they bought a self-paced training course and haven’t checked it out during the past 14 days. 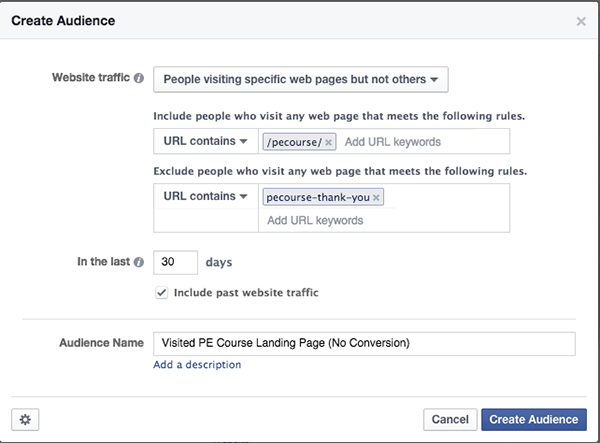 Finally, one of the options when creating a WCA is “People visiting specific web pages but not others.” One reason you may use this is when targeting people who have visited a product landing page but didn’t convert. Facebook also offers a “Custom Combination” option where you can include and exclude several combinations. Personally, I choose to keep it simple. I create a single WCA for each important page. That way, those WCAs are multi-purpose. I could target or exclude any individual WCA. If I combine them in a single WCA, it has only that purpose. Have you had success with Website Custom Audiences? How do you use them?